I’ll start with a personal confession: one of my (many) struggles as a parent is how to involve my kids more in community service and raise their awareness of causes and issues in the world around them. From talking to friends in our community and all the other parents on our team, I know I’m not alone. We all want to raise our kids to be kind, concerned and empathetic citizens – but the actual execution of getting involved is so daunting! How do I find a cause that they would understand and find relevant, a volunteer activity that’s appropriate (and welcoming) for kids, and fit it into our busy schedules?? So… I am really excited to announce the launch of the first KiwiCo Kindness Crate: Lemonade Stand – in partnership with Alex’s Lemonade Stand Foundation. ALSF is a national non-profit started by four-year-old Alex Scott in 2000 and is dedicated to raising funds for research into new treatments and cures for all children battling cancer. 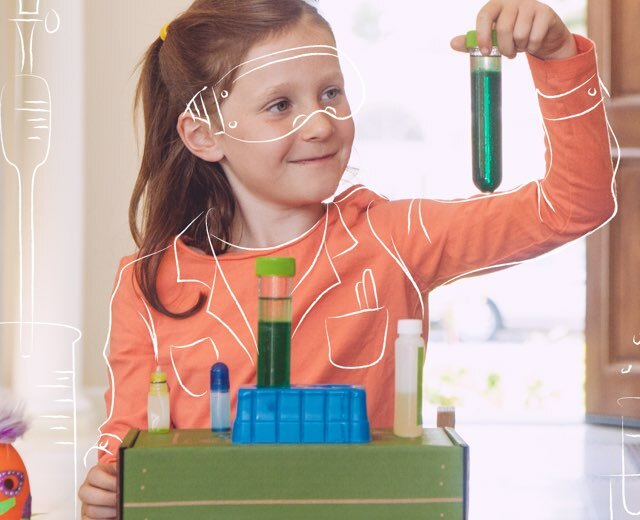 The activities and information included in this crate will help kids learn more about the work that scientists are doing to find better medicines and cures for cancer — and how ALSF – and kids just like them – help to support and advance that work. Also included are all the materials and instructions to build and run their own lemonade stand (including a “working” cash register and an adorable chalkboard sign for marketing purposes :)) to raise money for the cause (or any other cause that is important to them, really.) And as an added educational bonus, the crate includes some fun math games the kids can play with money; we provide KiwiCo currency – if they want the real deal, they might have to do the lemonade stand first! Finally, we are including a return envelope so kids can easily send their donations back to ALSF – and KiwiCo will be donating 25% of all sales of this crate to the organization too! We hope to inspire kids to become more aware of issues in the world around them – not in a way to make them feel sad or guilty about their own fortune in comparison, but in order to encourage their empathy for others … and to see themselves as agents of change and the creative problem solvers of tomorrow. Because, one thing is for sure, there will still be plenty of problems left for them to solve! We’d love to see any photos of your kids and their lemonade stands in action at #kiwicocares. And if you have tips on how you get involved in community service activities or issues with your kids, please share – great parenting hacks are always welcome!